Andrew P. Sykes is a writer and cyclist. 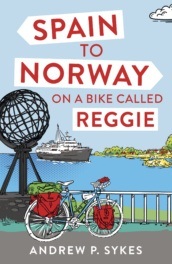 He is also a lover of those quirky, humorous travelogues that meander comically from one minor adventure to the next, and so writing about his own cycling adventures seemed the natural thing for him to do. When not writing and travelling, Andrew edits a popular cycling website, CyclingEurope.org, where you will find more information about his journeys and cycling and travel in general. For more details, visit apsykes.com, the Cycling Europe on a Bike Called Reggie Facebook page, and follow Andrew on Twitter @CyclingEurope.